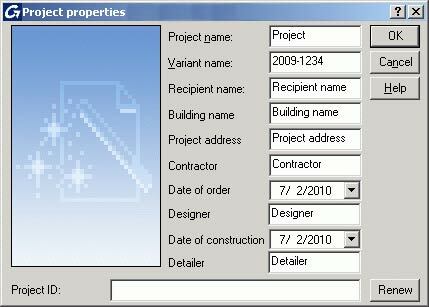 Project data can be inserted in the DWG project. In the Pilot, right-click Project and select "Properties..." from the context menu. The inputted values are saved as attributes and can be used in title blocks and lists. Note: You can create a line break by typing "\p" in the edit line. You also have to resize the text field in the title block. 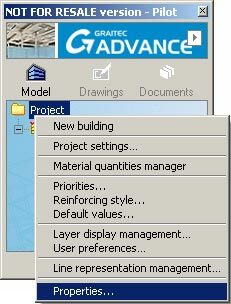 Project data is displayed in title blocks as attributes. First, insert the corresponding attributes in the template of the title block. An example is in "Titleblock A3.a.dwg" in "\Support\Sample\Document"..
You can create user-defined attributes for lists. First, in the list template create a text entry according to the pattern < User: Attributename >, where the text after "User" is also the description of the attribute in the properties lists. You can access this user-defined attribute from the properties list. Note: Newly created elements in templates must first be added in the lists using the tools for lists. The list generator can be started in START / Programs / Graitec / Advance Concrete / Lists.